Le procès de Guillermito, deuxième partie en anglais. This is the second part of an article on Guillermito’s trial for criminal copyright infringement. The first part is here. The following are notes and observations from a non-legal point-of-view: more about analysing the different players’ approach to the issue than about editorialising on French copyright law or the pitfalls of intellectual property. I am translating loosely (but as accurately as possible), paraphrasing minor bits I haven’t noted verbatim. Guillermito: The impression he left was that of a researcher (which is, after all, his profession), of someone who is interested in finding out and understanding how things work; and who won’t let a company get away with lies and exaggerations about the quality of their products if he is capable of proving otherwise. Which is all he did, in all openness. The judges: This sort of case is judged by a college of three judges, one of whom has the task of summarising the case. Some of the observers were a bit worried that the judges might be hampered by a (presumed) lack of understanding of computer matters (they were all over twice the age of the average member of the geek crowd, after all). But, pleasant surprise, the judge in charge of the case actually knew the file inside-out, had even understood the weaknesses of the expert’s report and asked relevant questions about technical details#. Of the other two, one was looking at Guillermito as if he was her favourite grandson (I think it was to mask her fatigue, and I don’t blame her; I rather admire the court’s endurance), the other one was looking a bit frazzled sometimes, but attentive and interested. The lawyer of the software company that filed the complaint: I think he was bad (yet, I heard the software company had hired an expensive and reputable firm). His technical explanations were, unlike the descriptions provided by Guillermito and his lawyer, incomprehensible. And the judges didn’t appreciate it, if their frowns are any indication. The public had a hard time to keep quiet (but managed) when he talked about all the infringing explanations on how to understand the workings of the anti-virus program, which were written down in “the program README.TXT, which is a text file” on G’s (closed down) server. Other than that, he was trying to be as insulting as possible, stopping short of calling G a terrorist (which his clients hadn’t shied away from in an advert), but by used and overused the sobriquet “byte apprentice” (apprenti-octet). And he told a woeful tale of the poor anti-virus program that G had endeavoured to break down, smash to pieces, batter, abuse and attack (I am not exaggerating), which is forbidden”. None of this seemed to make a good impression either. The prosecutor:# A formidable character, thundering down on Guillermito from the heights of his podium. He seemed to accept the results of G’s analysis — basically, that the program is a dud (un daube — suppressed laughter in the audience) — and even alluded to “companies that take 20 years to provide a stable operating system”. At this point I was itching for someone to bring up free speech. The prosecutor touched on “the right to criticise”, but only in the negative: critique is legit “within the limits laid down in Media Law, and not as a hacker (pirate)”. On the contrary, he pursued, “our society is at risk if it isn’t credible when it comes to intellectual property, in particular in the international context”. What follows logically is that the pursuit of knowledge and understanding, unless it serves immediate profit motives, is of no worth at all compared to the overwhelming importance of what derives from the free market and the protection of property rights. Empowering consumers (well, or simply people) and thereby opening an alternative to hiding behind the Law’s tutelage is not something the French Republic seems to consider as valuable. The enlightenment is a bygone era, its goals not worthy of further pursuit and made obsolete by newer and bigger challenges. This, I felt, was quite a big thing to swallow; it also captures what makes me feel out of phase with some of society’s norms. Not that I don’t care about whether I abide by the law or not; conflicts of principles are, however, possible. Guillermito’s lawyer: Suffice it to say that he was excellent. Impressively, he called the prosecutor’s “Robin Hood” bluff with an elegant reference to how the prosecutor’s discourse actually created a Robin Hood out of a simple researcher interested in computer. The stakes: I am not qualified to do them justice, so I will just briefly note that this is the first software copyright infringement case in France that isn’t about someone making and/or selling multiple copies of a proprietary program. On the basis of this alone, the case will set a precedent. Moreover, French law has recently incorporated some EU intellectual property directives, which will be put to test for the first time — in particular the part about what we are allowed to do with or to a program for purposes of testing, scientific investigation or review, even without the consent of the copyright holder. The legal technicalities will have to deal with the thorny point of whether or not you need a license in these cases (which is unfortunately a rather blurry issue in G’s case). The sentence of 4 months of probation plus a fine of 6,000 € was put forward by the prosecution. The defence wants a non-guilty pronouncement. Oh, and the software company wants 900,000 € in damages, a sum that even the prosecutor seems to consider rather outrageous. The saga continues with part three. : One exchange with Guillermito that made the geek crowd smile (paraphrasing): Judge — You’re talking about “attack programs” … api99 for example. What is this? Do you know about it? G — Oh yes, that’s a virus. J (slightly taken aback) — A virus?! G — Well, if you’re testing if an anti-virus program that claims to stop 100% of all viruses actually does what it says, you use viruses. You can download them on the internet. 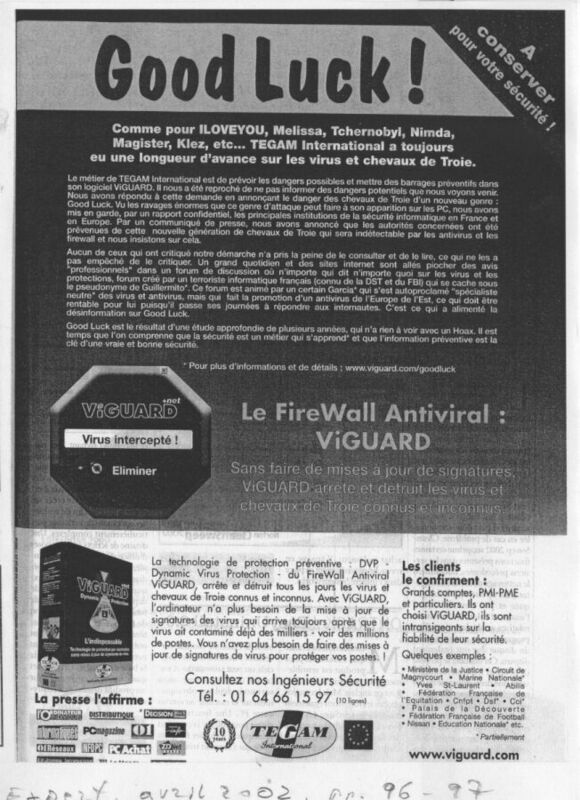 An anti-virus program is supposed to stop viruses by definition. J — Ah, yes, by definition. : One point should be noted here. The French criminal justice system being an inquisitorial (and not adversarial) one, the role of the prosecution (in particular) is much different from what it is in the US or the UK (and many other English-speaking countries). The prosecution’s task isn’t to prove the guilt of the defendant. As far as I can see, their job is twofold: a) representing the Republic (or society) and thus referring to the rule of law and the public interest (they also propose the sentence and are the only ones to get to do this); b) playing the role of the bad guy; in this capacity they get to scold and lecture the defendant, and to gesticulate dramatically.